Heads up! You will not be able to make an order unless you have added people to your account. Make sure to add people to your account for those you want to order lunches for. Make sure you have your school code handy. We are happy to have you apart of The Lunch MOB. This is a simple guide to help you take full advantage of our online store. Sign-Up If you haven’t already signed-up start by entering your email and school code. Manage People Once you have registered you’re ready to to add people to your account. Add Person You’ll be able to add relevant information and don’t forget your school code! Lunch Menu Once you have people to order lunches for you’re ready to visit the lunch menu to begin ordering lunches. Select the day of the week when you would like your child to have a lunch. Select one item available from the daily menu (entrée or sandwich or soup or salad). Select one fruit or veggie from the pull down menu. If you would like to double-up or order additional snacks you can repeat the ordering process for the same day. Once you’ve completed adding lunches to your cart, proceed to checkout. How do I remove items from the lunch menu? It’s quite easy, you need to make sure you’re on the lunch menu, and you’ve selected the child where you hope to update the lunch order before proceeding to checkout. Another way to accomplish the same task is to visit your cart where all lunches will be listed with child’s name, date, and school, here on this page you can individually remove each lunch as needed. In order for a refund request to be processed and accepted you must visit “My Account” page online while logged-in. On the main “My Account” page you’ll find a button beside certain orders (when available) called “Request Refund”. Click the button for the appropriate order in which you would like to request a refund. Remember you must select each individual lunch from the list in-order to properly request a refund. Make sure your “Request for Refund” is submitted before 12:00pm two calendar days prior to service to receive a 100% refund, otherwise a 75% refund is available for any Request for Refund submitted by 7:30am day of service. What are your ordering and refunds policies? Online orders or changes to existing orders, including cancellations, are due by 12:00pm two calendar days prior to service (i.e. Saturday by 12:00pm for Monday service) in order to receive 100% refund. A 75% refund is available for any Request for Refunds received online by 7:30am day of service. Emergency lunches are offered on the day of service and must be ordered by 8:00am day of service. Limited menu items are offered. What are your meal sizes? We offer two sizes: Jr. Varsity (regular) for $5.49, and Varsity (large) for $6.49. The basic meal includes one choice of entree or sandwich or soup or salad and a serving of fresh fruit or vegetable of your choice. One cold beverage and a packaged snack may be selected as an add-on purchase. Do you give back to schools you partner with? With every lunch and snack ordered we give a portion of the proceeds back to the school to help benefit learning in the classroom and invest back into each child’s education. We want not only healthy lunches but smart minds! What about deals and discounts? Buy 5 and save 5%. Buy 10 and save 10%. Buy 20 and save 12%. Buy 25 and save 15%. Can we order additional snacks and portions? Yes, it’s really easy. We offer a snack selection as part of our menu so you don’t need to order double meals. But, should you wish to double-up you can do that too! What comes with each meal? Hot or Cold Entree. You can choose an entree, sandwich/wrap, or soup/salad. Choice of Fruit/Vegetable. Please reference our menu to see what is offered. Choice of Snack. Available for an additional 40 to 45 cents. Please reference our menu to see what snacks are offered. Choice of Fruit/Vegetable. Please reference our menu to see what fruits and vegetables are offered. We believe in empowering parents, educators, and school administrators to make a healthy change in the classroom and in the lives of each student by putting a healthy twist on kids’ favorites lunches. As part of of our pursuit to feed students with tasty and nutritious food options we want to reward those who partner in our mission with incentives to help share The Lunch MOB with others. 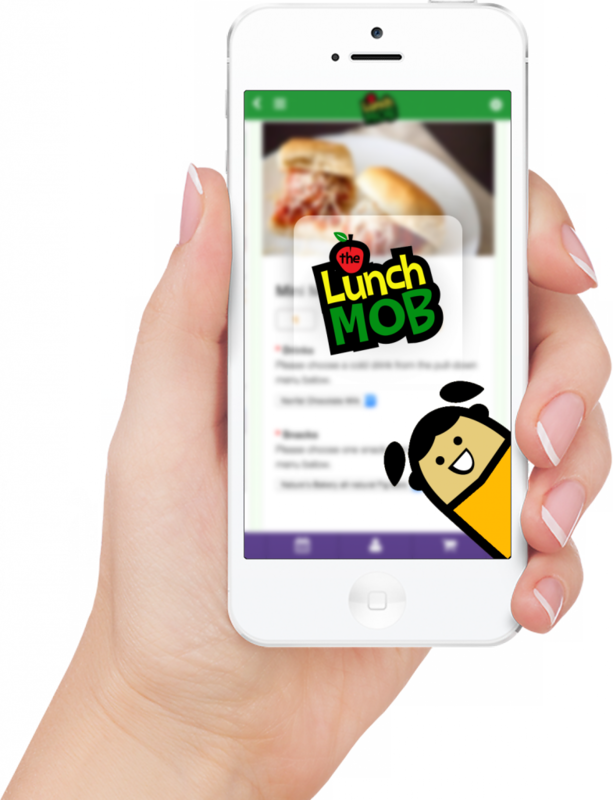 Share The Lunch MOB with other families at your school and be rewarded! Be a positive influence in your child’s class and school. Share your unique referral link and when a new parent registers and orders you will receive 25% off your entire order. Limit one coupon per-order. Coupon cannot be used in conjunction with other discount offers. When you refer us to a school administrator at a school where we do not have a partnership and we end up servicing your school, you’ll benefit with a week’s worth of lunches! Contact form must be filled out with referral school’s current e-mail address, phone number, and school name. In order to record your referral, please type in your name, e-mail address, and your school in the Comments section. Once the referral school has committed to The Lunch MOB hot lunch program, we’ll provide you with a coupon worth one week’s worth of free lunches! We’ve jam-packed all the same features online into our mobile app so you have the ease of ordering while on-the-go. You can make emergency lunch orders, request refunds, and much more! Download today and start ordering from your mobile device.